Oxford University Press (New York, 2013). 234 pp., $24.95. Cultural shifts in the age of marriage, the decline of the option for sacramental marriage among some Catholics, the demise of ethnic/religious enclaves in European American communities, and changing attitudes on human sexuality all have affected the Catholic ministry with young adults and marriage support. The church has made some developments to better support interchurch and interfaith couples and families, but pastoral implementation remains a challenge in many parishes and dioceses. 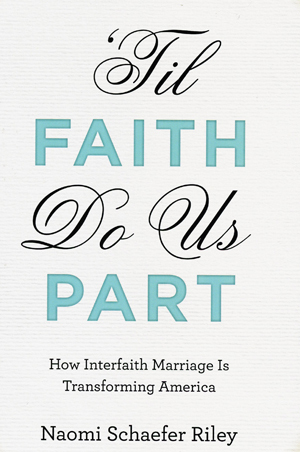 “‘Til Faith Do Us Part: How Interfaith Marriage Is Transforming America” will be a help to pastoral ministers, those in interchurch/interreligious marriages and especially those involved in marriage preparation and support. Christians make a clear distinction between interreligious and interchurch marriages; the latter, between baptized Christians, is considered sacramental by Catholics. This sociological study uses the term interfaith for both. Its primary focus is on interreligious marriages, with a few interchurch observations and examples. The highest rates of intermarriage and assimilation, and therefore a drain on that demographic, is in the Jewish community, the tradition of the author. For this reason, more attention is given to the findings about Jewish institutions and intermarriages. For a scientific report, the book reads well and provides several admonitions that go beyond her data, suggestions that will helpfully inform pre-Cana and marriage support programs. Even though pre-Cana and marriage support programs are often designed to serve interchurch, interreligious Catholic couples as well as families with two Catholic spouses, this study will provide further elements to watch for or to help couples. The study shows the wisdom of Catholic pre-Cana requirements, which are unique among most religious communities in the US. The study also shows the Catholic Church as the least welcoming (of interchurch/interreligious families and both-Catholic families) after marriage. The author, Naomi Schaefer Riley, is affirmative of interfaith marriages — she is in one herself). But at the same time she demonstrates that the culture of toleration and romantic attraction which has come to dominate the U.S. marriage market is not conducive to productive conversation on religion and other matters before marriage, and leads to higher rates of dissatisfaction and divorce among interfaith couples. Often problems that seem minimal in the dating and wedding processes become formidable with adult seriousness about religious practice and the onset of child bearing and education. The first chapter treats marriage definition, not only by the churches, synagogue and mosques formally, but also how individuals understand these definitions within their cultural location. In her analysis, she separates three Christian groups: Catholic, evangelical and mainline Protestant, with Mormonism as another category. Chapters two and three cover the challenges and resources in marriage preparation and the wedding ceremony. Passing on the faith to children of interfaith couples and dealing with holiday celebrations are covered in chapters four and five. Chapters six and eight deal with divorce and the welcoming character of different faith communities to interfaith couples. Finally, two chapters are devoted to particular cases of significance: the Muslim interfaith experience and the difference between Mormons — who seem to have the best success with retention of their members in interfaith marriages — and Jews, who have the worst record. The volume concludes with a number of generalizations and recommendations. In the Catholic community interchurch marriages are more frequent than interreligious ones, but both deserve special support and attention, especially with the decline of Catholic schools and urban ethnic enclaves. Work for the unity of Christians has been a major priority for Catholics for 50 years. Building strong families is a central mission of the church and the presence of interchurch/interreligious families provides us a particular opportunity and challenge. Brother Gros, a member of the Brothers of the Christian Schools, is resident scholar in Catholic studies at Lewis University in Romeoville, Ill.